What is better than a lovely bowl of hearty soup when the weather starts to get a bit chilly? A soup can be made from a few humble ingredients, but can yet make a filling and healthy supper. Heat the oil in a large pot. Add the bacon, onion, celery and carrots, and cook, stirring frequently, until the onions are translucent. Add the garlic, thyme, salt, ground black pepper, chilli flakes if using, bay leaves, the cubed potatoes and the split peas. Pour in the water, add the stock cube, the tomato puree and bring to a boil, then reduce the heat to a very low flame. Cover the pot, but do not cover completely so as to allow room for steam to escape. Cook the soup, stirring every once in a while, until the split peas and potatoes are very soft for approx half an hour to three quarters, then add the brown rice and continue cooking till rice is tender. Before serving, remove the bay leaves and add additional water to get the soup to the consistency that you prefer. Season and stir in the freshly chopped parsley. You can also serve this with some Parmesan shavings on top. 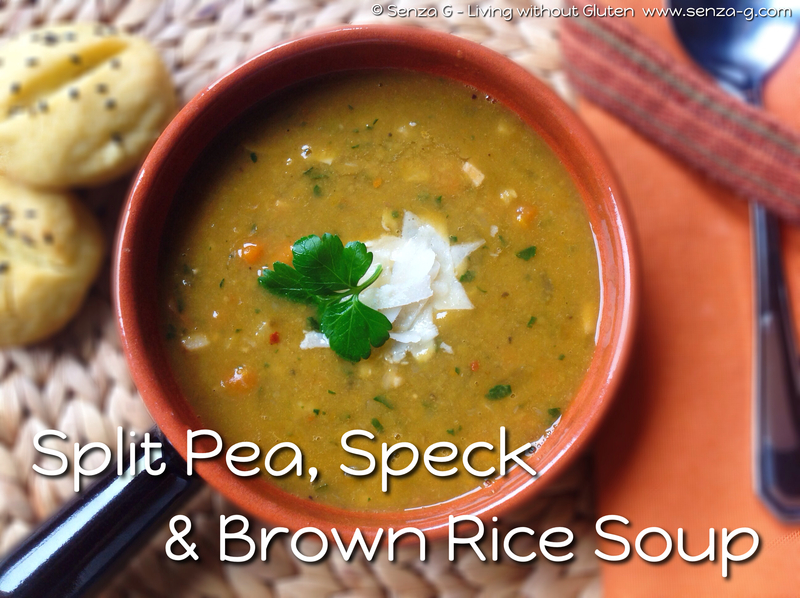 * Split peas do not need to be soaked overnight. Soaking helps cut down on the cooking time. If you soaked the peas, follow recipe as above. If you do not soak them overnight, then simmer for approximately 1 to 2 hours until tender, adding the potatoes after the first hour and a half of simmering. Proceed with the recipe.